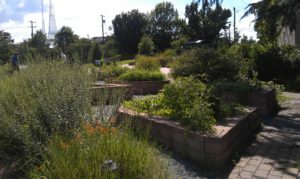 The Potomac Chapter ASLA was awarded ASLA’s 2010 Community Service Honor Award for their work on the Calvin Coolidge High School Garden, Greenhouse, and Guide. This award was possible through the generosity of chapter members who donated their skills, time and talents and because of the extremely positive response of the vendors who generously donated their goods to the project effort, allowing the large garden to be designed and installed at his garden in partnership with the Coolidge Alumni Society and the ACE mentoring program. The garden has been largely sustained by efforts led by the Coolidge Alumni Society and has touched hundreds of other corporate volunteers, as well as the students who have been engaged with the garden over the past six years. The Potomac Chapter ASLA and the local chapter of the Landscape Contractors Association recently held a work day at Coolidge to clean up the garden. You can learn more about the garden history on YouTube: https://mail.google.com/mail/u/1/#search/coolidge/15c2071b167bdf2e?projector=1. The Potomac Chapter looks forward to hearing any input or suggestions you may have for ways to continue our progress, or to improve our direction. All members are welcome at ExComm Meetings, usually held the 2nd Monday of the month. Check out the calendar for the next location and time and take an active role. If you live in Washington D.C., Northern Virginia or Maryland you can CHOOSE to be in the Potomac Chapter. Second, specify you want to be associated with Potomac Chapter. Third, come out to our next event and introduce yourself. We have lots of opportunities to get involved! If you'd like to volunteer as a resource or committee member, email us. © Potomac ASLA 2019. Theme designed by CPOThemes.